John and I had guests over the weekend. Part of my upbringing says that you have to feed people to death to make them feel welcome. I baked some amazing Pumpkin Donut Muffins and a Sausage and Egg casserole (which will be featured in a future post) for breakfast. In the afternoon, we attended an Octoberfest celebration, and had a couple German beers. For dinner, it was steak filets, with my Potato Packets, and Fancy Pants Green Beans, a loaf of french bread and a couple glasses of wine. We said goodbye to our friends on Sunday morning, and after all the food and beverages we had enjoyed, John and I grabbed our bikes and headed out for a ride. We love starting out at a trail close to a local farmers market. When we finish riding, we can grab some produce for the week. I found some beautiful carrots and some kale among other veggies. I intended to lighten up our meals for the week, and even though we are pretty health conscious, we have never tried kale. There are so many ways to prepare it, but I really wanted to prepare it raw in a salad, and decided on a recipe from Chef Meg on the website Sparkrecipes.com called Massaged Kale Salad. This Salad appealed to me because of the simple ingredients, and not one grain of salt. I also liked the idea of tenderizing it with a gentle massage of the vinaigrette. I started by removing the thick stems and tearing the kale into bite size pieces. I rinsed it several times and spun the leaves dry in my salad spinner. I prepared a Garlic Dijon Vinaigrette, also developed by Chef Meg, by putting 2 tablespoons Dijon mustard, 2 cloves minced garlic, 1 lemon juiced and zested (about 1/4 cup), 1/4 cup red wine vinegar, 1/2 teaspoon ground black pepper, and 1/4 cup extra virgin olive oil into a small food processor. Run until the ingredients are combined and emulsified. 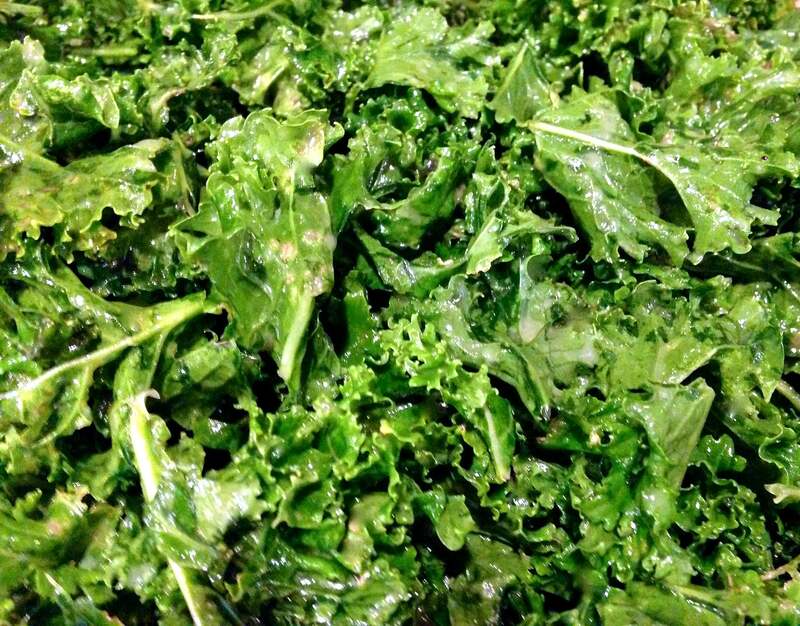 Place the kale into a large bowl, and add 4 tablespoons of the Garlic Dijon Vinaigrette, the zest and juice of 1 lemon, and 1/2 teaspoon of ground black pepper. Massage the ingredients into the kale for 5 minutes. Cover and refrigerate for 4 hours or overnight. Prior to serving, I plated my kale and added thinly sliced carrots, grape tomatoes, and some honey roasted slivered almonds. The almonds added just enough sweet and salt for me. You could add any combination of nuts, vegetables, boiled egg, dried fruit, cheeses or protein. It’s so versatile. I ate this salad for lunch with a side of fruit and was in yummy land. I had a great lunch that did the body good! Combine all ingredients into a large bowl and massage for 5 minutes. Cover and refrigerate for at least 4 hours or overnight. Combine all ingredients into a small food processor and run until combined and emulsified. I was taught to pick the kale after the first frost, but it sounds like this massage method would be particularly good for the pre-frost kale. Thanks for the tip. Love the sound of this dressing Julie! This sounds perfect and looks so pretty! Thanks for sharing! I didn’t make that up, but it did tenderize the kale. Yum, I love kale salads, I’ve never had a massaged one before but I love the idea! That is why I made it too. I had been overdoing the not so good choices and needed to get back on track. It worked nicely. Thanks Julianna! Ha! Did you see Tracey’s comment? You aren’t the only one. I am a kale novice too. Tracey said to put apple and feta in the salad for a nice twist too. Thanks Judi! Yum, my first dish to try at FF. I always play a game of “what would I eat first?” when I arrive at Angie’s. Wow Julie, looks fresh and delish. 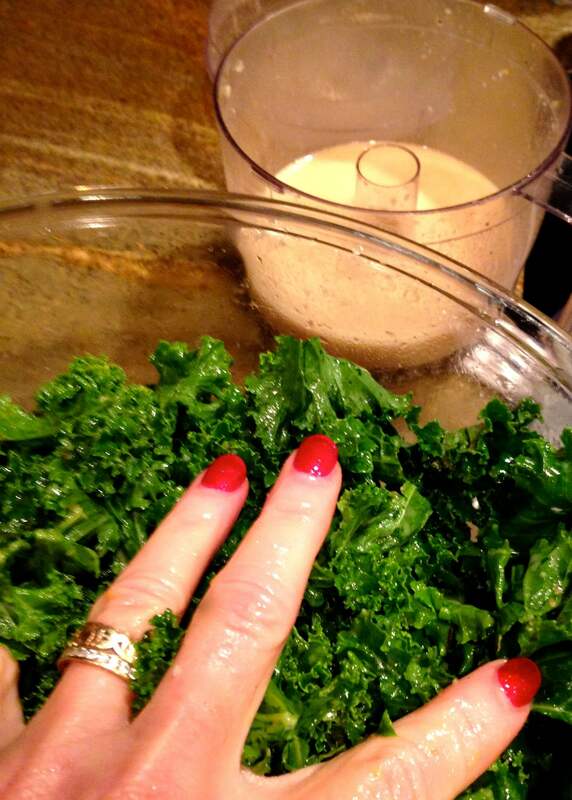 … love kale and your dressing sounds great and can’t wait to give it a try…. Thank you Chitra! It was delicious. Show it some love :). Definitely remove the stem and ribs too. The photo is awesome and the salad sounds delicious. Thank for sharing! What a great-looking, healthy salad–and the vinaigrette sounds so good! Thanks Dawn, It really does make a difference. Please let me know what you think. Love massaged kale and love your salad!! The dressing alone sounds delightful! Will have to give this a try. Thanks Patti! The dressing is very light and flavorful. It would make a great marinade too. Sounds like such a fun weekend! And the salad looks delicious! A little too fun Alex! The salad was a good way to get real again! Thanks Petra! 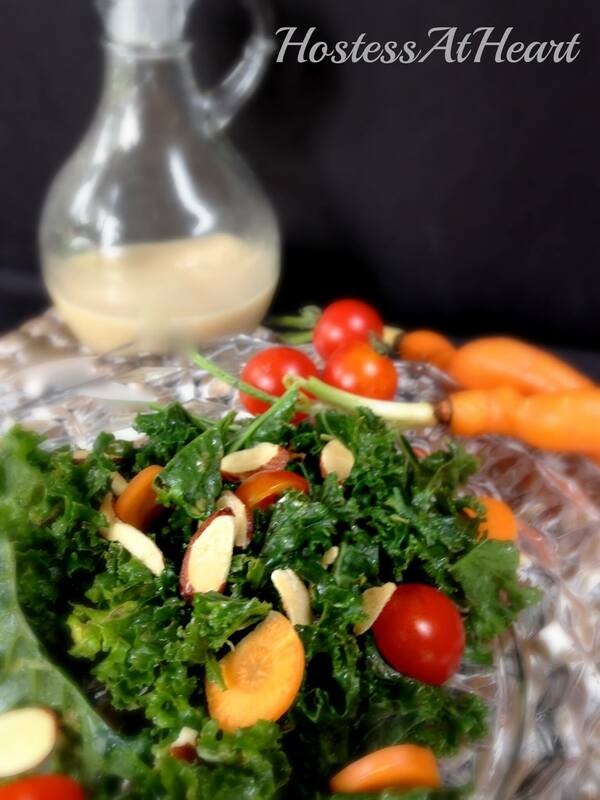 I love the tenderness that the kale took on by marinating it in this light yummy vinaigrette!